Editor’s note: today’s caption is the answer to the July puzzler. Roughly 117 million lakes dot Earth’s land surface, Landsat data show. Most of them look something like this—small, circular bodies of water sprayed like buckshot across frigid tundra in the far north. 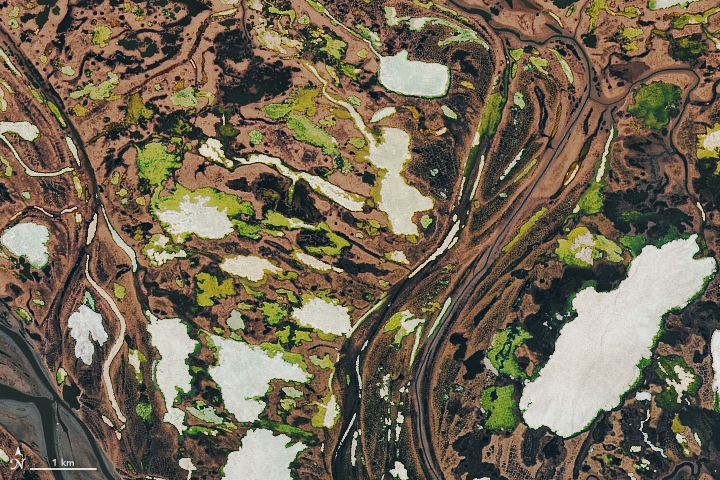 On June 18, 2018, the Operational Land Imager (OLI) on Landsat 8 acquired this image of the swampy, bog-filled terrain of the Yana River Delta in northern Russia. Warm weather had recently melted off the snow cover, exposing the brown, waterlogged tundra before grasses or other vegetation had emerged. 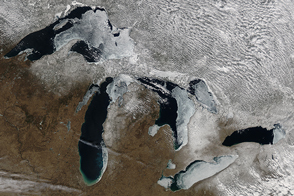 Several of the deeper lakes appear white because they were capped with floating ice. Other lakes appear green-yellow because a layer of water—rich with yellow dissolved organic matter from decomposing vegetation (gelbstoff)—and algae had flooded the ice. 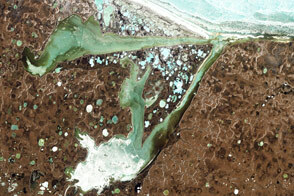 The Yana River Delta falls within a zone of continuous permafrost. Ground temperatures about 20 meters (65 feet) below the surface are roughly -10 degrees Celsius (14 degrees Fahrenheit) year round. “The deeper lakes don’t freeze to the lake bottom, resulting in a year-round unfrozen part beneath the lake bottom, called taliks,” added Frank Guenther, a permafrost researcher with the Alfred Wegener Institute. Several winding distributaries of the Yana River meander northward through the delta toward the Laptev Sea. 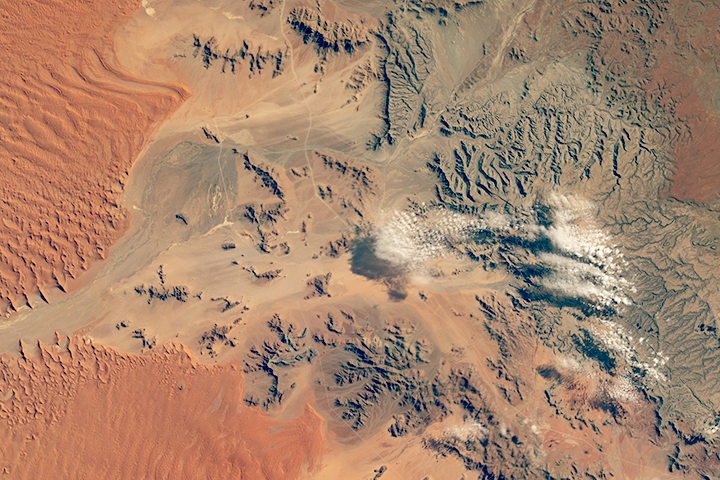 The volume of water transported by the Yana varies significantly throughout the year. July and August, when the most snow and ice melts, accounts for more than 80 percent of the annual discharge. By October, the lakes have usually frozen again. Lakes in the far northern latitudes are known for being important sites of microbial activity that can make them sources of carbon dioxide and methane, particularly when soils and permafrost undergo cycles of freezing and thawing. With signs of mammoth hunting that happened as early as 27,000 years ago, the delta contains some of the oldest known evidence of human habitation of the Arctic. 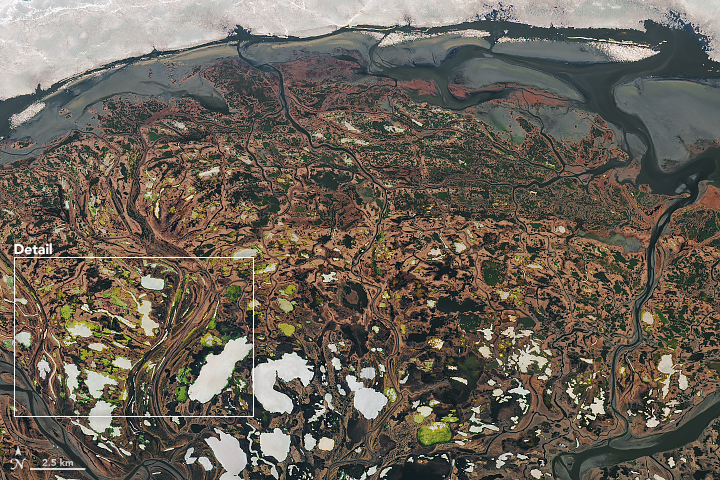 Tens of millions of small lakes dot frigid tundra landscapes in the Arctic—like the swampy Yana River Delta. GIS Lounge (2014, October 1) How Many Lakes are there in the World? Accessed July 27, 2018. NASA (2012) Leaking lakes. Accessed July 27, 2018. 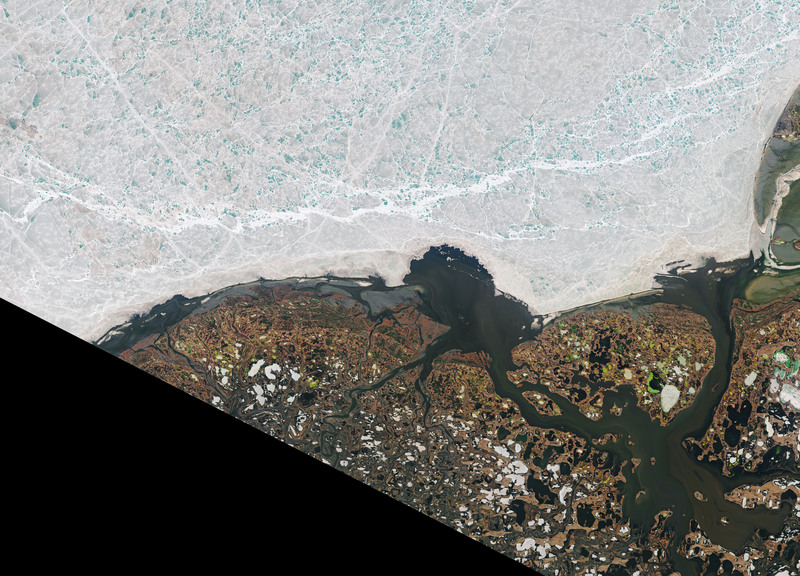 NASA Earth Observatory (2016, April 1) Picturing Arctic Permafrost. Accessed July 27, 2018. Olefeldt, D. (2016) Circumpolar distribution and carbon storage of thermokarst landscapes. Nature Communications, (7) 13043. Pitulko, V.V. et al. (2016) Early human presence in the Arctic: Evidence from 45,000-year-old mammoth remains. Science , (351) 6270, 260-263. The Siberian Times (2017, March 23) Discovered: 200-plus Arctic lakes which bubble like jacuzzis from seeping methane gas. Accessed July 27, 2018. Verpoorter, C. et al. (2014) A global inventory of lakes based on high-resolution satellite imagery. Geophysical Research Letters, (41) 18. UCI (2018, January 31) Arctic lakes are releasing relatively young carbon. Accessed July 27, 2018.